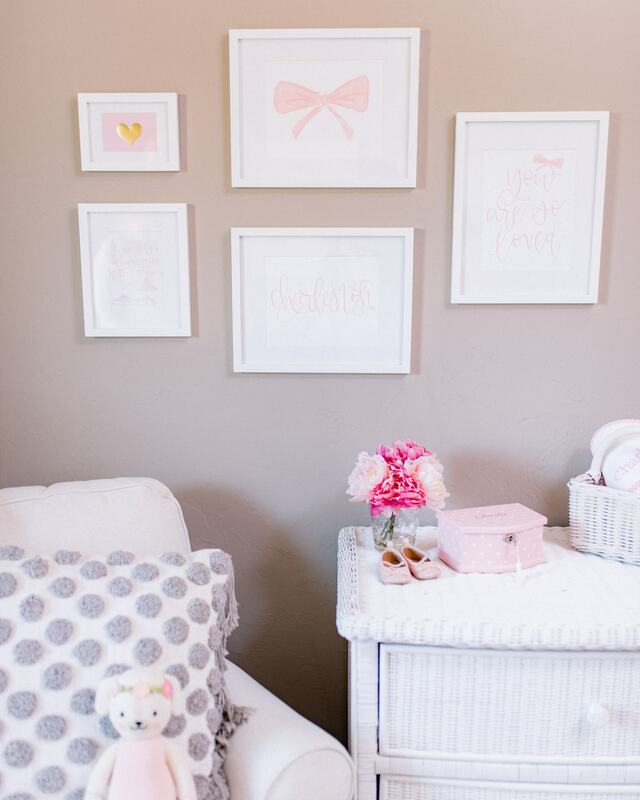 I’m so excited to finally share Charleston’s nursery with all of you! 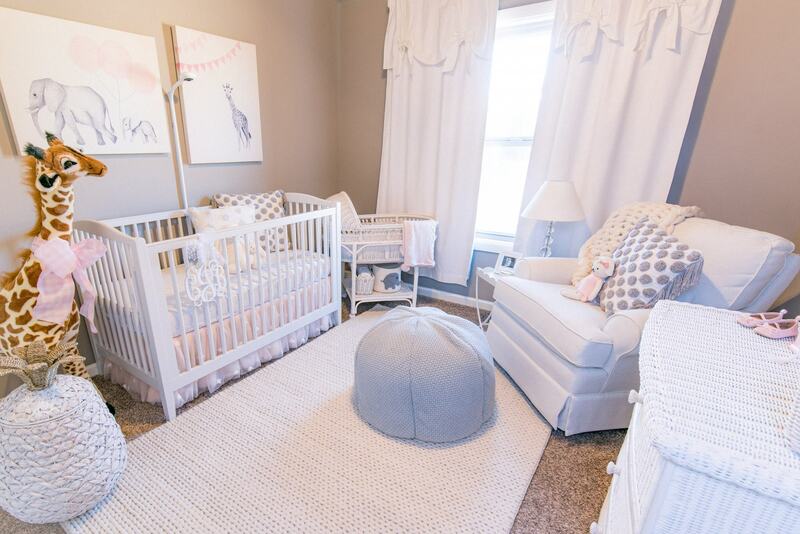 It has easily become one of my favorite rooms in our house! It is all the blush goodness that I ever dreamed of! 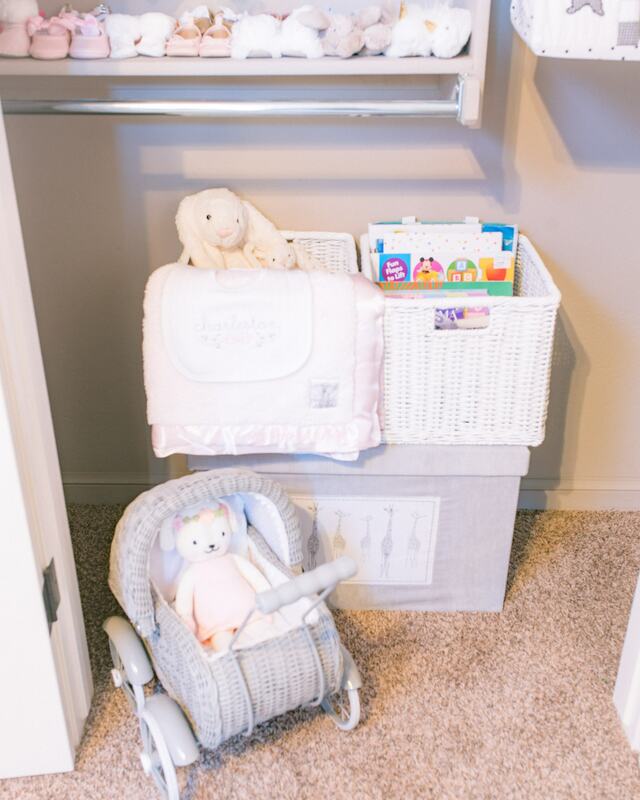 Every time I walk by, it puts the biggest smile on my face, and makes me so excited for our little one to arrive. 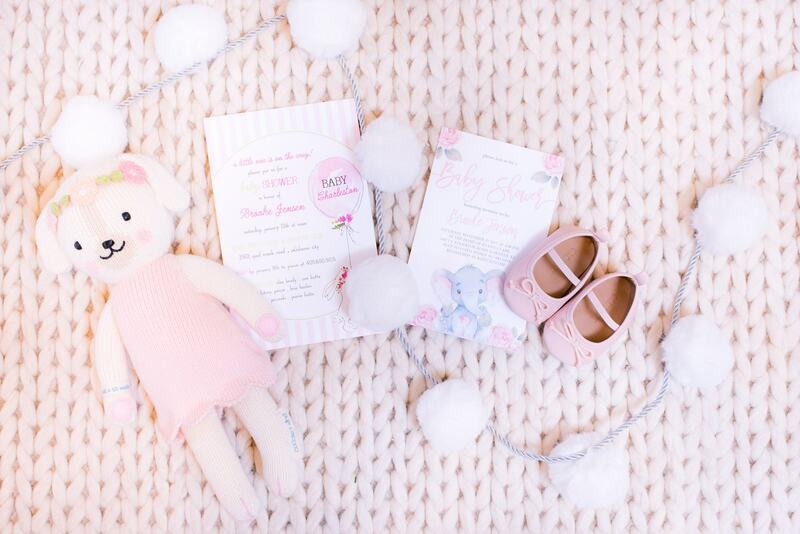 If you read our gender reveal post, you know that we swore our little babe was going to be a boy. 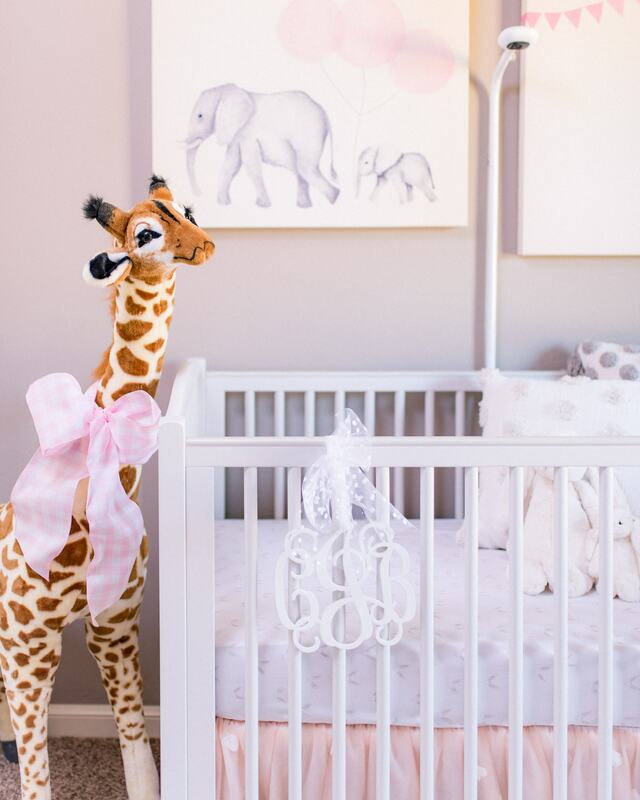 All of my nursery decorations started with the sweet little art prints of the elephant and giraffe over the crib (but in BABY BLUE for a BOY)! 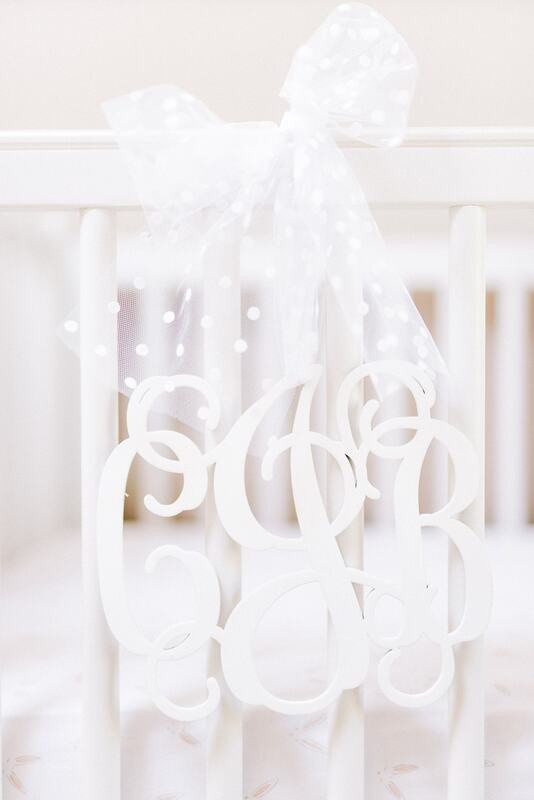 I already had planned out ALL of the baby blue and white ticking stripes I was going to incorporate! 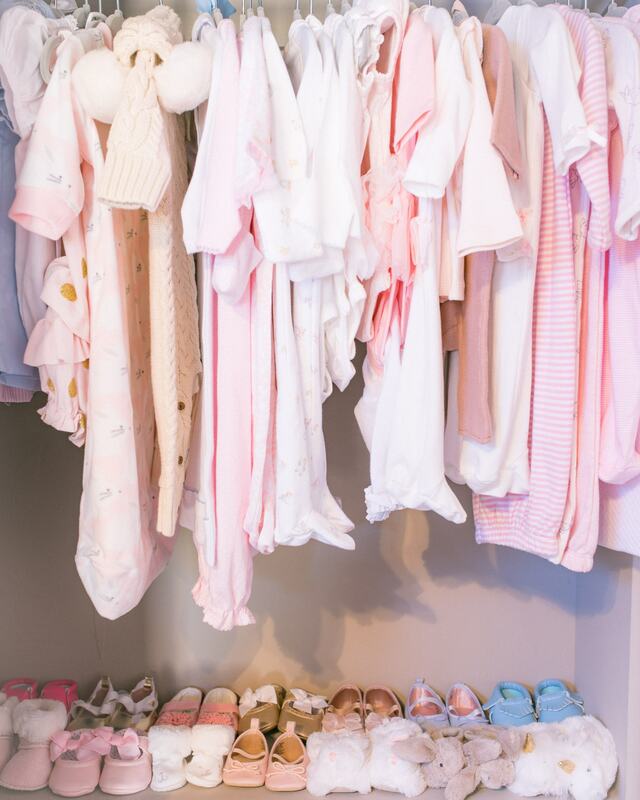 When we found out we were having a girl, back to Home Goods I went and ended up switching out the prints for the pink version. (P.S. Home Goods has the MOST amazing stuff for nurseries at such reasonable prices!) 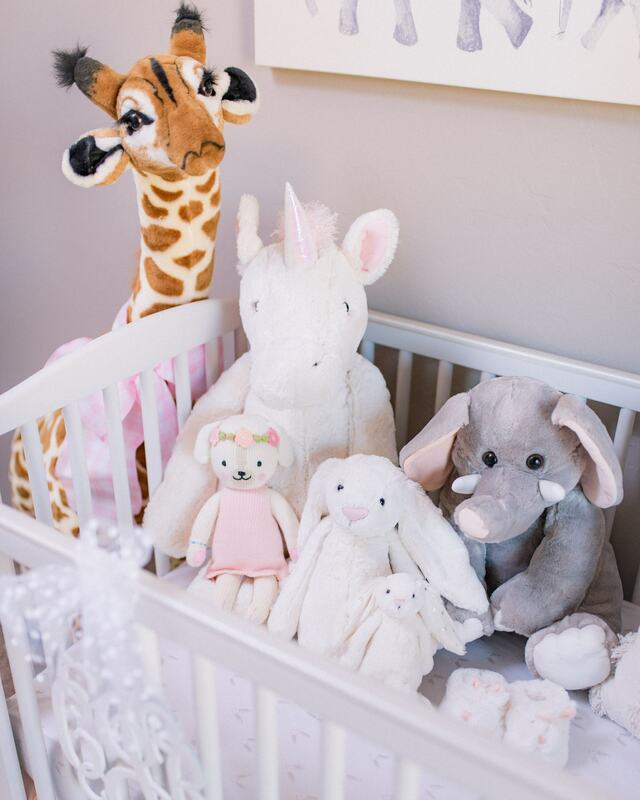 This started my whole animal theme for Charleston’s nursery! 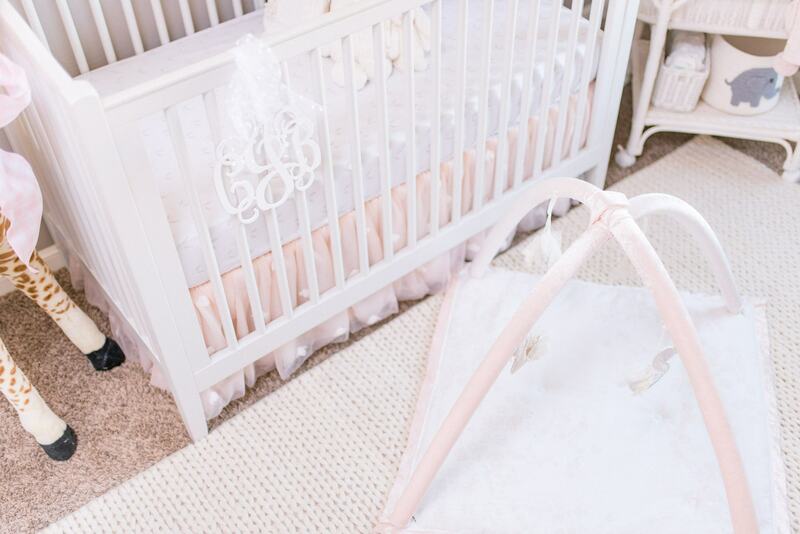 I knew I wanted to incorporate more girly items into her nursery, so I chose this darling tulle crib skirt from the Monique Lhuillier Collection at Pottery Barn Kids. 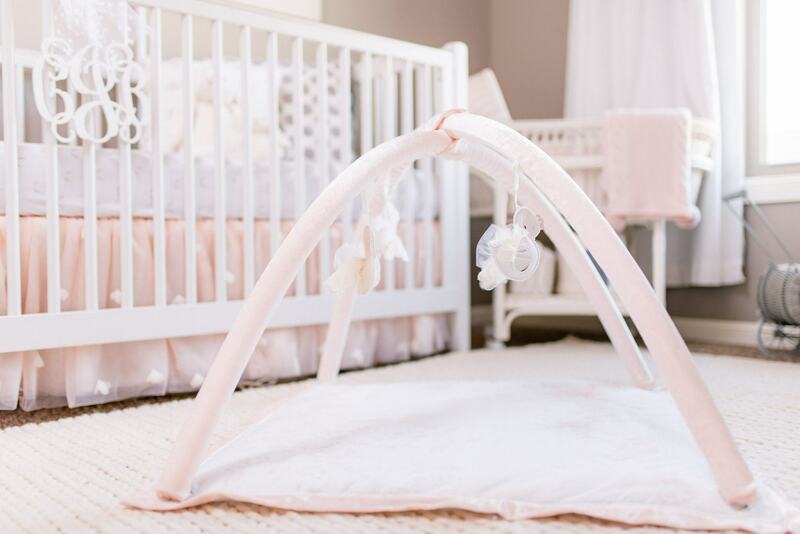 The collection also comes with the cutest bumper pad and quilt, but every recommendation says these items are a definite “no no” to prevent SIDS (CRY FACE!). 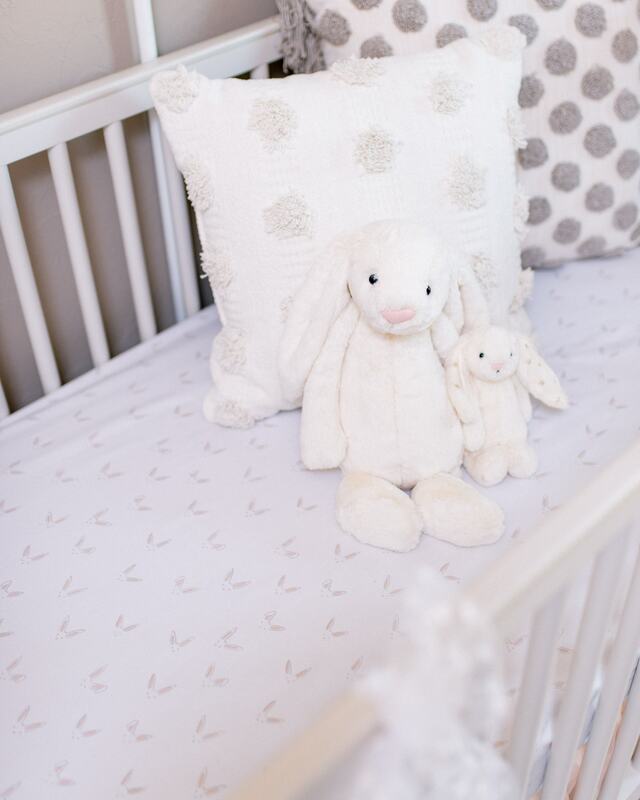 I wasn’t a huge fan of the butterfly crib sheet that came with the collection, so I opted for this sweet bunny crib sheet from RH Baby. The blush matches perfectly! 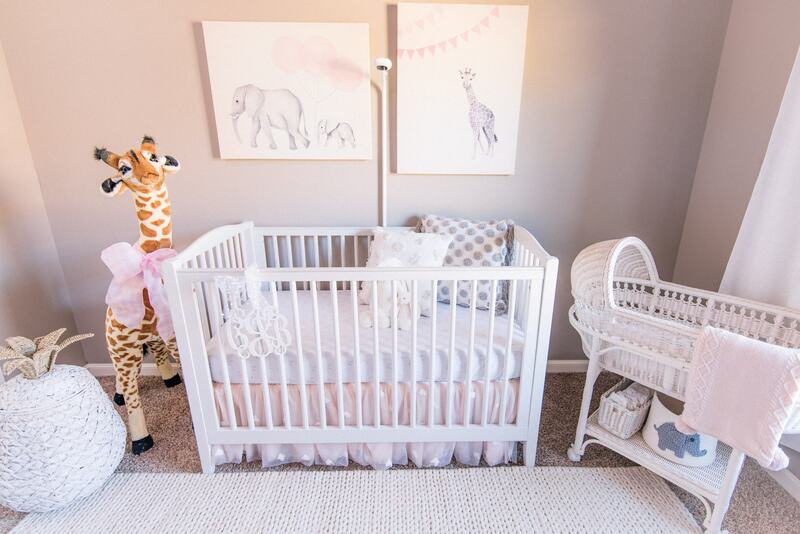 Our big purchases for her nursery were the crib and rocking chair. I knew I wanted something white, and I wanted it to have the perfect spindles! 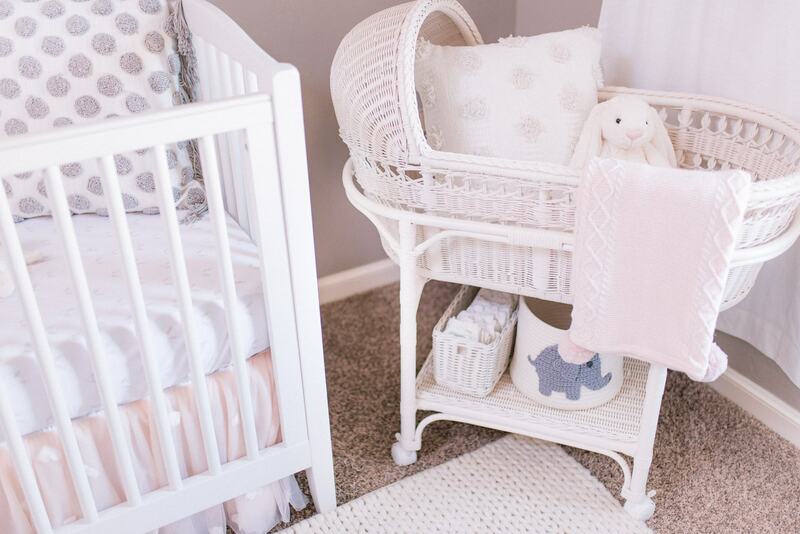 We splurged on the Emerson Convertible Crib from Pottery Barn and rocking chair from Buy Buy Baby. 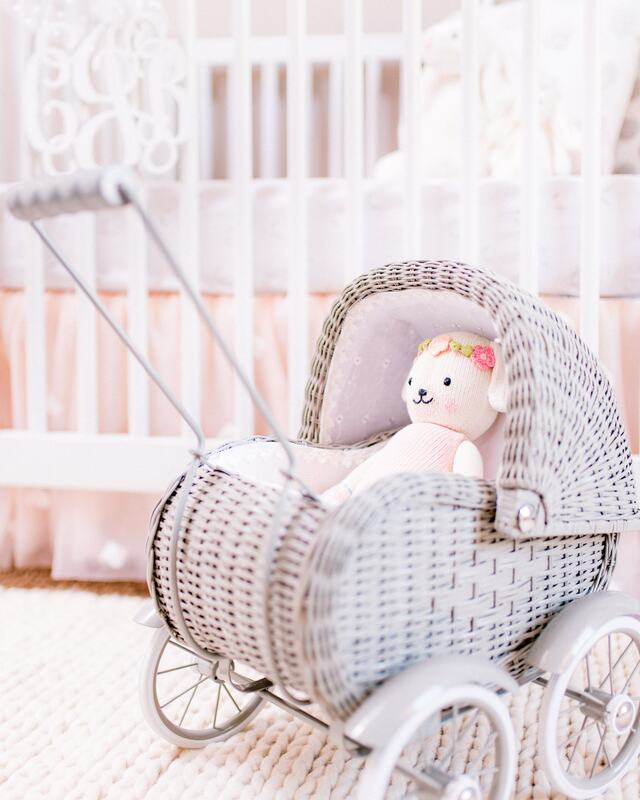 Buy Buy Baby doesn’t have the exact chair linked online, but it’s still available in stores. For both of these items, I would highly recommend having a coupon! Pottery Barn Kids has sales on furniture pretty frequently. 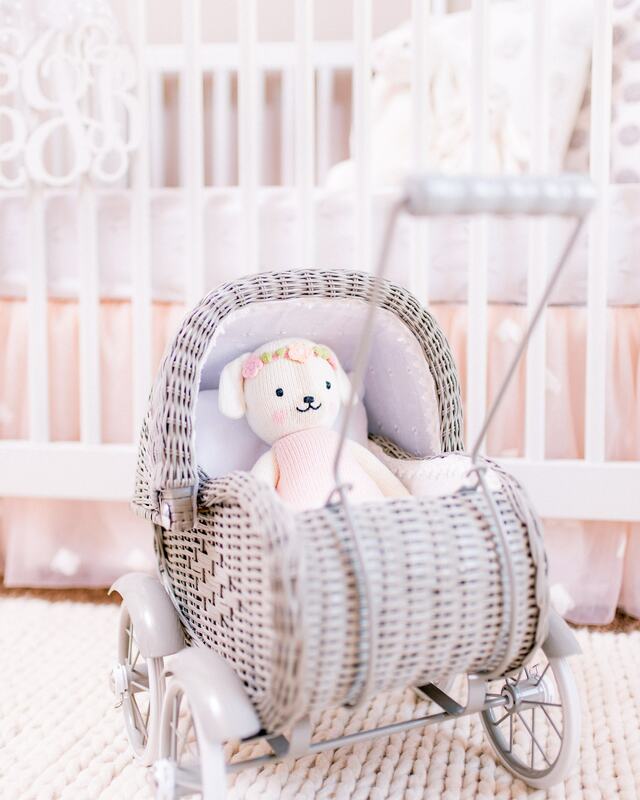 For Buy Buy Baby, make sure you take any 20% off discounts you receive for Bed Bath & Beyond since they are owned by the same Company. After finalizing the major pieces, I had so much fun shopping for all of her accessories. 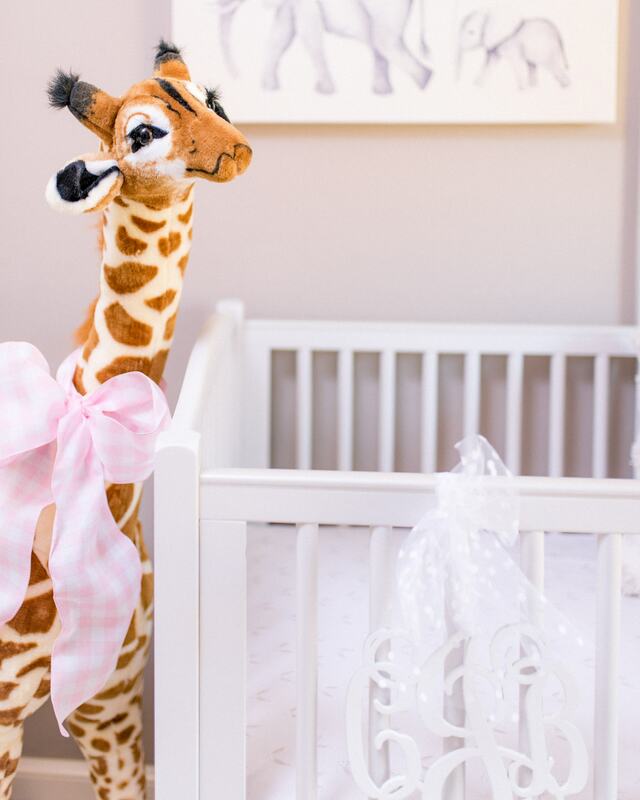 Two of my favorite items are this darling little doll pram and her jumbo giraffe! 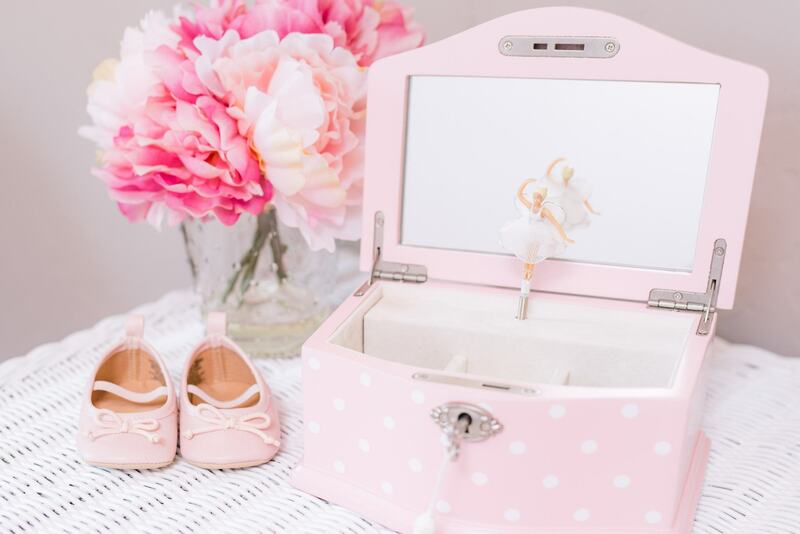 I know she is going to love playing with these items as she gets older! I also want to thank my sweet friend Ali at Type Setter Designs for making the custom art prints for Charleston’s gallery wall! I thought they turned out so darling! I’ve tried to link all of the products I can below, but let me know if you have any questions! 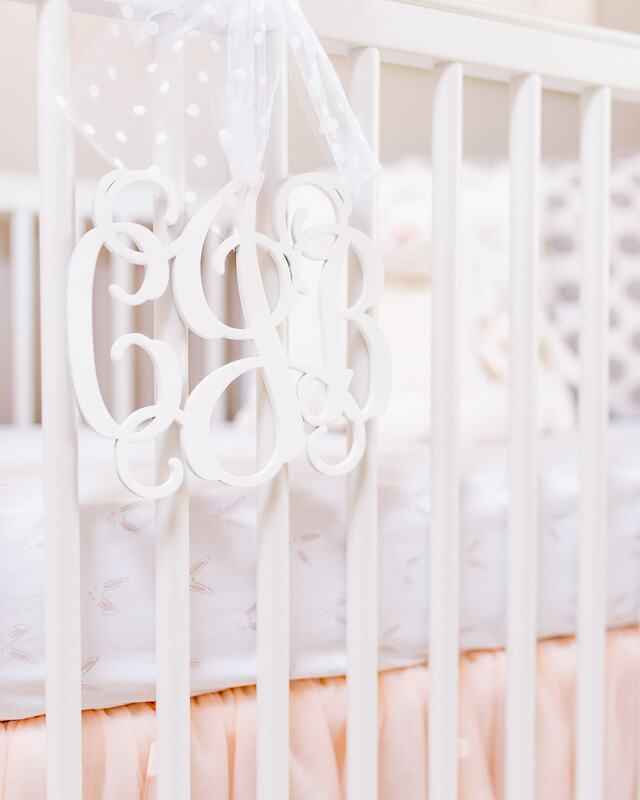 Now that Charleston’s nursery is complete, we are just anxiously awaiting her arrival!!! !